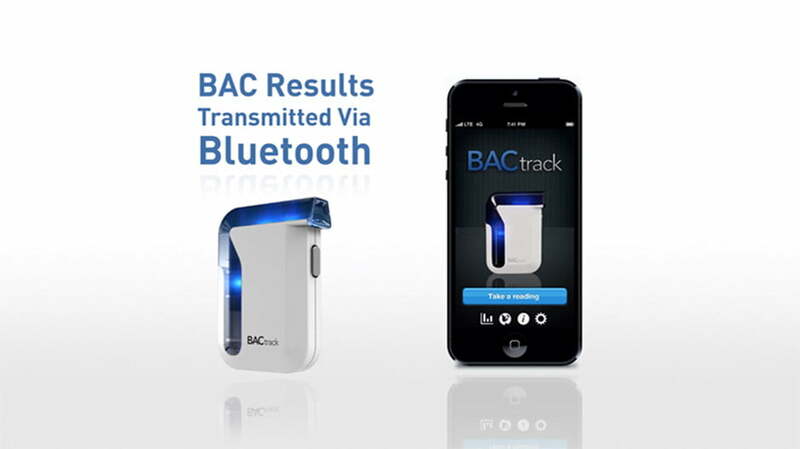 The BACtrack Mobile is BACtrack’s newest offering taking your traditional breathalyzer one step further, by allowing you to pair it to a smartphone or tablet via Bluetooth. In 2011, less than 10,000 Americans were killed in drunk driving vehicle incidents across the nation. While the number is still shockingly high, the figures are the lowest they have been in over twenty years. The reasoning behind the dropping numbers is the sheer amount of focus we as a country have put around drinking and driving. More police officers, stronger laws that impose more fees upon those who are caught, and the huge number of personal breathalyzer units available to the public. While personal breathalyzers are nothing new, BACtrack, one of the most well known and trusted breathalyzer manufacturers out there, has changed the concept to fit the digital age we have grown to love. The BACtrack Mobile is BACtrack’s newest offering taking your traditional breathalyzer one step further, by allowing you to pair it to a smartphone or tablet via Bluetooth. Wait a minute, pairing your breathalyzer with your smartphone? That’s right, but who would want this and why? First off, for those who don’t know what a breathalyzer is, it’s an electronic device that screens the blood alcohol content in your breath. Alcohol is first consumed through various means and absorbs into the bloodstream, when the alcohol-laden blood moves across the membranes in your lungs it permeates your breath. Since we know that the ratio of breath alcohol and blood alcohol is 2100:1, you can calculate the blood alcohol percentage via breathe resulting in your Blood Alcohol Content. Now that we know what a BAC unit is used for, why should you care? The BACtrack Mobile is a professional alcohol screening device made for anyone who wants to either keep track of their alcohol percentage, or keep track of someone else’s. It is incredibly easy to use, and can spit out readings within minutes of opening the package. All you have to do is open the BACtrack app, pair your BACtrack Mobile to your iOS device via Bluetooth, and click “Take a Reading.” After you blow into the device it will relay back your BAC level, as well as a handful of other features we’ll explain momentarily. While BACtrack touts that the mobile companion app is compatible with the iPhone 4S, iPhone 5, iPad 3, iPad Mini, and iPod Touch 5, the app isn’t utilized for all listed devices. iPad users will have to first find the iPhone/iPod Touch version of the app in the iTunes store, then use the app in iPad compatibility mode since it isn’t universal. We would have really liked to see a universal app, or a companion app that links the iPhone and iPad apps together. Device gripes aside, the companion app does include some really neat features. First off, the main feature of the BACtrack Mobile is the ability to view and track past readings. The BACtrack Mobile sorts readings either by 6 hour blocks, or 14 day blocks, and all are sorted by date and alcohol percentage. When you take a reading on the unit, you can mark it as your own or a friends, and can tell the app if the test was verified by waiting 15 minutes before any food or drink. After marking who took the test, you can even tag which drinks you’ve had, add pictures and notes, and then share the test should you want to at the end! The share feature is really useful as every test will tie in your GPS location if you enable the feature. Should you get to the point where you’re unable to drive or don’t want to, you can jet off a text to your buddy and they’ll be able to come pick you up at the test location as long as you don’t stray too far away! Speaking of the app, one of the biggest downsides of the BACtrack Mobile is that it requires your phone or tablet for any readings. Should your iOS device run out of juice, your breathalyzer is rendered useless until you’re able to remake that trusty Bluetooth connection. Either an LCD display for quick readings that don’t need to be saved, or some kind of internal storage that could upload to the app once connected would have made the device almost perfect. To ensure the BACTrack Mobile wasn’t just a new tech gimmick we tested it side-by-side with our freshly calibrated BACtrack S70 unit. Even after 20 tests scattered over a few days, the BACtrack Mobile was never more than .002% off what the S70 displayed. Great to know that the glowing BACtrack name wasn’t tarnished with a unit that’s so different from previous models. Also included with the BACtrack Mobile is a charging USB cord, three mouth pieces so you can test with others and not have to worry about germs, and lastly a nice little carrying pouch. The pouch is a nice touch, but we were only able to place the unit and a single mouthpiece inside, forget about the charging cord and additional mouthpieces. The BACtrack Mobile is hands down one of the best breathalyzer units we've ever used. It's compact, it's accurate, and it allows you to track your blood alcohol percentage over time. While the price is a bit steeper than other units, the Bluetooth app functionality is a huge step in the right direction. If the unit had an LCD screen to display readings without a phone or tablet, we'd be screaming our love from the rooftops. There's always the next model though, right?